The Harvard Graduate Student Union sponsored a rally earlier this month to demand a new contract that better protects victims of sexual harassment or discrimination. The ongoing negotiations between Harvard and the newly-formed graduate student union have raised many issues regarding graduate students’ quality of life, such as access to internal arbitration policies and professional development resources. While the complexities of the Harvard Graduate Student Union-United Auto Workers’ demands and the University’s resource constraints make the negotiation process nuanced and complex, we hope that both sides are able to come together in a productive and speedy manner that is as fair as it can be to all involved. One issue that has taken center stage in the ongoing contract negotiations is the union’s insistence on a provision that would allow members to pursue a neutral third-party grievance procedure to arbitrate complaints of sexual harassment and discrimination. The University has expressed multiple concerns about this proposal, claiming that a third-party arbitration process would lack the “thoroughness, fair play, and due process” of its own internal policies. We disagree with the University on this issue. 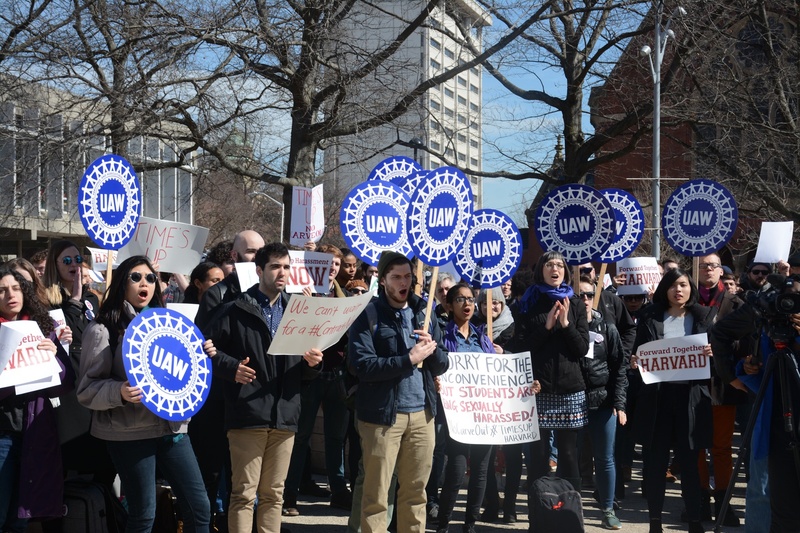 Given Harvard’s lamentable history in dealing with cases of sexual misconduct, notably in cases like that of Government Professor Emeritus Jorge I. Dominguez, we broadly agree with HGSU-UAW on the need for a neutral arbitration procedure to review grievances brought against the University with regard to discrimination and sexual misconduct. Given the many ways in which students can and have been discriminated against on this campus historically, we do not believe that Harvard should have sole oversight in internal cases brought against its affiliates. We have repeatedly stated that the University must rethink and refocus its internal culture and policies with regard to sexual harassment, and we feel that other instances of discrimination — on the basis of race or disability status, for instance — must be treated in a similarly impartial manner. We understand that there are significant legal and ethical complexities that would be involved with a major institutional shift of this nature, and any new changes, including the potential creation of a third-party grievance procedure, must be studied with care. However, Harvard’s own grievance procedures and resources can be seen as complicated for those forced to navigate them. Students already battling to seek justice for assault or discrimination must not be asked to fight on two fronts — one against the accused and another against uncooperative institutions. It bears repeating: Sexual assault — not to mention discrimination on the basis of a host of different factors — occurs with troubling frequency to many on this campus. We hope that both parties eventually come to an agreement to help process future occurrences in a way that is acceptable to all. We also wish to show our respect on a personal level for the graduate students who are negotiating with the University on behalf of HGSU-UAW. We consider their actions to be selfless and admirable, especially because they seek to not only better their own situations, but also those of students who come after them, given that any contract that is finalized will likely far outlast their own time as Harvard students. In light of all this, as we have expressed in the past, we continue to hope that University representatives keep the best interests of graduate students at heart and that both parties continue to pursue these negotiations in good faith. What Is Wrong with Harvard?